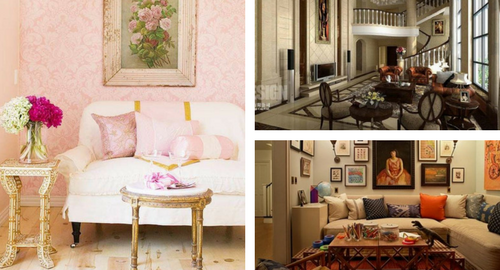 Traditional home décor is timeless ideas that you can use forever without getting outdated. It originated from the old eighteen century time so you can actually choose several traditional themes to use in your house. This theme will not only make your house become more beautiful but you can really feel the elegant atmosphere that this time will give to every room. No wonder even people with modern house still want to apply traditional theme in their interior since it look very luxurious. You can try to mix and match modern and traditional items if you want so it would still support your modern lifestyle. The color scheme of traditional house is actually more colorful than you think of. Most people think that traditional house is filled with boring brown color but you can actually use other color. For example you can try to use green or peach color for the main color then use tan or aubergine color for the accent. With this color scheme you will get a colorful pallet which not boring but still have the traditional feeling. Do not forget to use bronze tone for other items to give warm feeling that traditional style should have. For the traditional home décor window treatment you can use formal treatment with swag as well as panel for the combination. You can make the window appear higher by hanging the swag taller than the window frame thus making faux window frame illusion. To arrange it, you can gather the panel together on the side then tied it with cord that has tassels for decoration. The swag can also be decorated with fringe or other smaller tassels to make it more beautiful, choose textured material so it would not appear cheap. When it comes to traditional home décor, pattern is a must but you could not use any pattern that you found since traditional design has specific pattern to use. First pattern that you can use is damask pattern which already famous for traditional theme. Then you can also use floral pattern but make sure that the pattern is all over the surface. Then you can use those patterns on many things such as the wallpaper and the cushion of your sofa or even pillow for your living room and bedroom, but keep the usage moderate so it will not feel too much. The best traditional home décor that you must own is an oil painting with still life art or other kind of art that you like. You can put those arts in every room to give it dramatic effect. Combine the art with your family picture which will give the room romantic feeling and even more personal appearance. Not only the painting will increase the value of your design since it now incorporate art, but your design will appear more elegant and sophisticated as well. Try to make the painting to be the center point of the room if possible. Usually people will keep minimum lighting for traditional home décor to give the design romantic atmosphere. But you still need to think about the kind of lighting you will use in the room. To enhance the romantic feeling even more, try to give the room chandelier as lighting. Not only chandelier suitable as traditional house lighting but it also very beautiful to look at. Of course you need to choose traditional type chandelier but crystal chandelier also work best with the traditional theme. Make sure the size of the chandelier is suitable for the room so it would not be too big or too small to light everything. Traditional design is classic theme that does not tied with any time, which is why people love to use it since they do not need to change their house theme anymore. If you want to use this theme you should know that the design can give many kinds of feeling into your house according to the way you design it. You can try to create elegant feeling by using simple pieces in your living room to make it more interesting. Romantic feeling is more suitable for your bedroom or bathroom with more private usage thus you can make use this atmosphere more. Luxurious feeling can also be achieved by using this feeling which you can also apply in your dining room where you could entertain people. All you need to do is to choose which feeling you want to achieve with this theme then design the room accordingly. There are a lot of items that you could use to achieve the feeling such as silverware, flowers in beautiful vase, luxurious material, and many others.